Bali and Fiji could easily be confused because they are both popular island holiday resorts in the Pacific Ocean. However, geographically they are very different. Bali is an Indonesian island situated north of Perth. Fiji is part of the Melanesia of Oceania, in the South Pacific, and situated north of New Zealand. Bali is one island and under the Indonesian Government, while Fiji is a series of smaller islands. 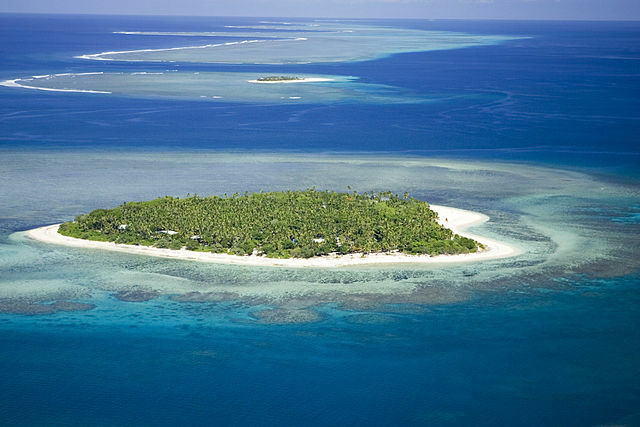 There are two main islands that make up the civilized area of Fiji and only 10% of the land mass, of the group of islands, is inhabited. The climate on both these islands is similar, and very suited to the tourist industry. The Bali and Fiji island resorts are very popular with Australians due to the easy access they have to the islands from Australia. The time difference between the two destinations is significant, depending which part of Australia you are traveling from to get to the island resorts. Fiji is one hour ahead of the east coast of Australia, while Bali is three hours behind the east coast of Australia. However, once you are on the islands, time is of little relevance as the holiday spirit is part of the reason for the islands being so popular. Bali is reputed to be a great place for a family holiday. Beautiful beaches and holiday entertainment for the whole family. The Balinese people are friendly and peaceful. They go out of their way to make families feel welcome to their holiday paradise. Bali is situated at the western end of the Sunda Islands between Java West and Lombok East. It is an island of flowers, temples and a temperate climate, with some interesting attractions. When visiting Bali you can see tall volcanoes and beautiful jungle areas as well as the beaches. Mount Agung is an an active volcano registering on alert 3. Bali is approximately 153kms wide (95miles) and 112kms long (70miles) It is surrounded by coral reefs and white sandy beaches. The climate is an even temperature of around 30 degrees celcius or 86 degrees fainthearted. What do holiday makers love about Bali? Holiday makers love the even temperate climate. The friendly welcoming people make everyone feel comfortable and relaxed. It is a family holiday destination. The beaches and the island attractions make Bali a great holiday island. It is easily accessible to the Western Australians and popular for a family holiday. The general tone of the way of life is peaceful and accommodating to tourists. Fiji is a cluster of islands in the Pacific Ocean. It occupies around 194 000 sq kilometers. There are 332 islands and 106 are inhabited with only 10% of the land actually in use. The islands are mountainous, covered with tropical forests, and some higher peaks up to 1,324metres (4341ft) the two most important and largest islands are Viti Levu and Vanua Levu. The tropical marine climate is warm all year round. In 2016 Fiji was hit by a cyclone, cyclone Winston. This cyclone killed forty four people and damaged homes to the estimated amount of FJ$2billion. Apart from this cyclone disturbance Fiji is a peaceful destination for holiday makers. What do holiday makers love about Fiji? Fiji offers a great holiday place with a temperate climate and beautiful beaches. The beaches in the South are covered with white sand and the beaches in the North and west have black sand. Fiji makes a wonderful holiday resort catering for families. Fiji is close to the eastern side of Australia and this makes it in easy reach for the eastern community of Australia. The cuisine is most enjoyable with access to fresh food and an Asian or Chinese influence. Bali and Fiji generally speaking are on opposite sides of the Australian continent. Bali on the west and Fiji on the east, although they are both in the Pacific ocean. Bali is closer to the Equator than Fiji. Both islands have mild temperate climates almost all year round. Fiji has experienced some damaging cyclonic weather. The main resource of the islands is the income generated by tourism. Neither of the islands has any real industry. They make beautiful fabrics in Bali of batik and ikat cloth and fishing generates some income as well. The people of the Fiji islands are very creative and villages will adopt a particular craft and everyone will be involved. Tourism is the main focus of the Fiji income due to the popularity of the islands as a holiday destination. 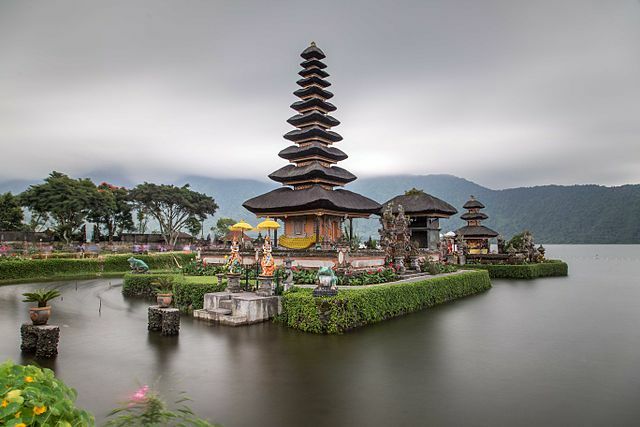 The people of Bali are influenced by Hindu and Buddhist religions. They love having festivals and enjoy traditional dance. The Fiji culture is affected by the Melanesian or Polynesian cultures of the Pacific. These island people seem to have adopted a mixture of cultures from China and Indian origin. The island cultures are steeped in symbolism and story telling through the medium of dance and ceremonies. The Fiji men and women wear traditional grass skirts for their ceremonies and this is how they welcome arriving guests. The Balinese people wear their colorful batik and dyed fabrics. Men enjoy wearing loose batik shirts while the women wear a skirt wrap around called a wiron and a fitted dress top. The fabrics are colorful reflecting the colorful surroundings of the beautiful island and the turquoise blue sea. Rugby is a popular sport in Fiji and the Fijian team, known as Fiji Bati, played in three World cup series and made it to the semi finals in 2008. Wayang or Shadow Play is part of the Balinese theater. Flat cutout figures are silhouetted against a background of rice paper and the puppets tell traditional stories. Both the islands rely heavily on the tourist industry. Their temperate all year round climate and the beautiful beaches, together with a relaxed culture, make these two different islands places perfect get away holiday resorts. Bali and Fiji are beautiful islands in the Pacific offering holiday resorts for families. The climate of both these island areas is temperate and great for holidays. Both Bali and Fiji are part of the Coral Triangle and this huge area of marine life is totally unique. Known as the Amazon of the Ocean the marine life and coral is unique. Bali and Fiji are peaceful places and the people focus their attention on making tourists feel comfortable and at ease. The people of these island love to dance and wear their traditional clothing. Most of the people follow the Hindu or Buddhist religions. They enjoy ceremonies and festivals. Bali has the added attraction of a live volcano while Fiji has many tiny islands with some mountainous terrain. Tourists enjoy some markets where they can buy traditional fabrics and ornaments. Wood carvings are popular too. Fiji has taken part in World Cup rugby events. Before the game they perform a war cry called the Cibi. It has similar connotations to the New zealnd Haka, based on Maori traditions. Touring the islands of Bali or Fiji will always be a great experience for visitors. The people of these island paradises are warm and friendly and the climate and beaches ensure a tropical holiday that is sought after. As an Australian living on the West coast Bali would be a natural choice while the east coast Australian would gravitate to Fiji on the east coast for their holiday adventure. Christina Wither. 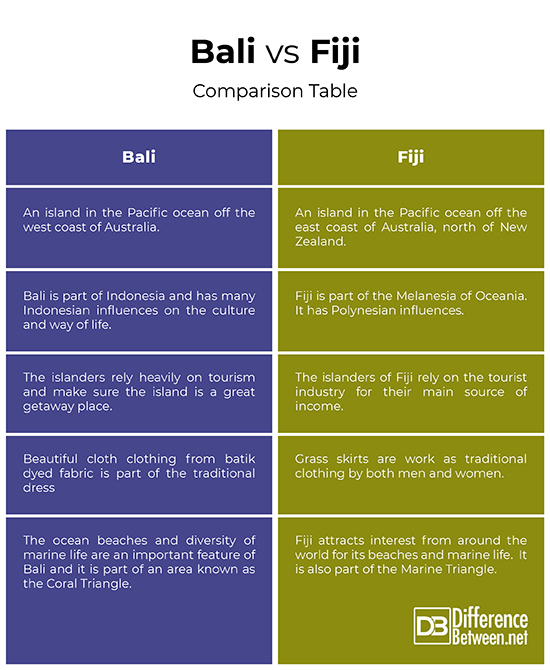 "Difference Between Bali and Fiji." DifferenceBetween.net. March 5, 2019 < http://www.differencebetween.net/miscellaneous/geography-miscellaneous/difference-between-bali-and-fiji/ >.